Spring is on the way! At least it should be. All around us, nature is bursting into bloom, and we should be too. Shake off the weariness of winter, take off those protective layers, and let the sun warm our skin. How do we do this? We start dreaming. This is always the time of year that I start to dream again. I dream of summer holidays and lazy days. I make lists of all the things that make me happy about this time of year, all the things I can look forward to as the days get warmer and longer. There’s power in lists, and power in dreaming. What are lists if not dreams aided by intention? You definitely want to do them, you’ve committed to them on paper! Whether you get around to it or not, you’ve taken it from the subconscious to the conscious realm. And that means something! Are you feeling a little more hopeful now that spring’s rolling around? We become more curious when everything about us is changing and growing, don’t we? The days I’d rather stay curled up with a book and a cup of tea are behind, and now is the time I want to go walking in the woods, looking at everything with wander and excitement. It’s the perfect time to get inspired, and to be open to that creativity. Go on the walks you did as a kid- get excited by the sound of the ice-cream truck, the smell of the seaside. Dance to cheesy music and fall in love too quickly. Access the things you’ve not done in a while, and the memories will start flooding back. Capture these moments like polaroids, cherish them, swim in them. When we make ourselves open to the tiniest details, when we fine tune and really pay attention to the fabric our lives are made of, we become open to it. So, dear writers, I encourage you to cherish the playfulness of life, to roll up your trousers and waddle out into the pool of your childhood memories. Make lists, make plans, get excited. 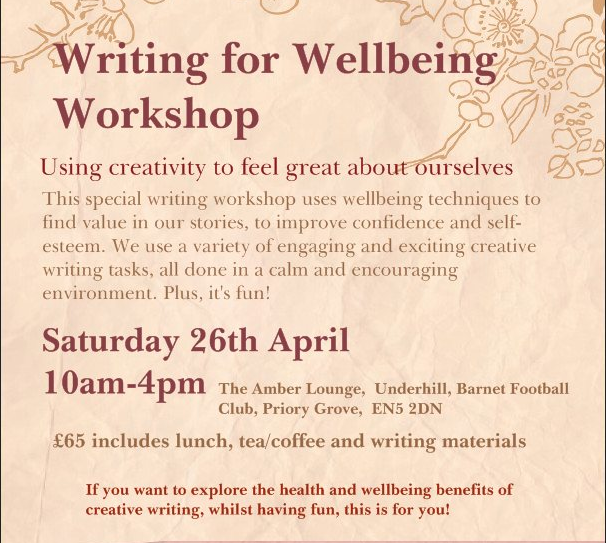 And if you’re feeling the renewal and revamp vibes this season, we have a couple more spaces left on the Writing for Wellbeing Workshop next week (Saturday 26th April) in Barnet. Plus we’re doing a special Easter Sale, so if you enter the Promo Code: FACEBOOK50 you’ll get the whole day workshop for only £32.50! Previous postGet Creative? Get 50% OFF! Hi, that’s fine, just please link to this page, and credit me! Glad you think it’s useful- happy writing!